The FCC Information Commons (IC) is a Ewing Memorial Library initiative. It is a 21st century learning space that integrates the expertise of a skilled reference/instruction librarian and technically proficient staff to help the users with their on-spot intellectual and technology needs. Purpose built comfortable and flexible discussion areas and meeting rooms for group collaboration and collective tasks for academic purposes as well as individual work areas for serious and focused research in an environment conducive to learning.This is a one stop shop for users to get printing and publishing support that facilitates the users in finalizing their projects conveniently in one place. Quick and guided access to information resources (online and offline) provided with high-speed network, latest computer hardware and utility software. 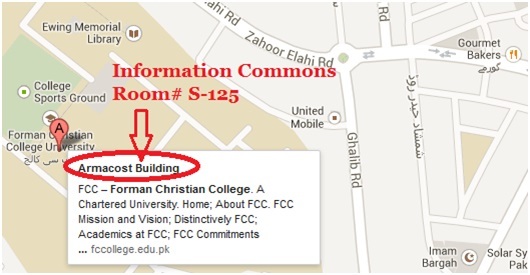 FCC Information Commons is a state of art the facility where learning takes place through collaboration, cooperation, curiosity and creativity.